May very likely be bringing a new to me boat home soon.......anybody crossing the gulf south bound in the next couple of weeks?? I think Dimer2 is in the Destin area now and will cross soon to Clearwater. May want to message him. I think he is in Panama City now, if he was able to make his schedule. This time of year there are many "loopers" and snowbirds making the crossing. The shortest route is from Carrabelle to Tarpon Springs. We crossed last week from Port St. Joe which added about 60 miles to the trip. Some go direct from Panama City which adds a bit more. I know there are still loopers behind us some of which are crossing this week during a very nice weather window. You may want to look around the marinas for the AGLCA burgee and talk to members getting ready to cross. There is a bunch of chatter on their web site about weather and who is crossing when but you need to be a member to get most of the useful information. I used several weather sites to determine when we should cross. Pensacola Surf Report (STORMSURF) is one of my favorites, gives you a nice long range sea forecast. Another good one is MarvsBuoyReports which is free but you have to sign up for. Hope this helps. Chasing 80 is now in Dunedin looking forward to a nice cruise south toward the keys. I hope your deal works out. Get to Applichicola, Carrabel, or anchor behind Dog Island. This time of year you should be able to find company for the crossing. They usually wait out weather in those places. Y'all are wonderful.......first thing is the boat deal.....once that works out, I'll have a better time frame....Hope this weather pattern lasts a few weeks! We crossed a few days ago from Dog Island. Ended up in an eight boat flotilla. They had an 'on the hour' role call on channel 71 and it was all pretty orderly. They were headed for Tarpon Springs but we veered east into Crystal River. It was kinda nice knowing there were other cruisers out there and we followed them on radar and radio for several hours after leaving them. Only saw one other boat (a shrimper) out there the whole trip. It's on bought my girl last week.......will be crossing the gulf early week after next.....YES!! So, ended up in Panama City for the last 3 weeks getting this girl in shape for the trip. Ended up with a blown head gasket on port engine due to a clogged heat exchanger. Spent the last 3 weeks replacing every hose, clamp, cleaning all oil. trans coolers, replaced one engine water pump, repaired broken packing gland bolt, replaced all engine and generator fuel line, cleaned all racors and sea strainers , pretty much cleaned the entire bilge with the clothes on my body a little everyday. she's ready. what a task it has been but the amount of neglect was to great to not do this stuff. But I lost my window with my sailing partner. Now I cant leave till Feb 1st. I have concerns crossing the gulf in February. What say?
. I have concerns crossing the gulf in February. What say? No more concerns in February than at any other time. Just be sure and check for cold fronts coming, since they can make things uncomfortable. Personally, I like to hug the coast, though, spending a night in Steinhatchee. It is a tad further, but not all that much further. Ditto what jwnall (John) said. Just wait for a weather window, and roughly follow the two-fathom line. Other little diversionary ports-of-call are Cedar Key and Yankeetown, though both are a long run inshore and/or upriver. Mighty good seafood, though. This is still a "new to you" boat and since the maintenance hasn't really had a shakedown cruise. I would not, therefore, head across from Panama City. I would follow the coast a while, checking out Port St. Joe, Apalachicola and Carabelle. Once in Carabelle, I would make my decision on crossing. Carabelle is a great jumping off point to a cross, but also that gives you time to sort out any issues and leaves you with the option of following the coast around. That shortens your crossing by about 60 nm as well. Here is an interesting weather site, click on the small Gulf Of Mexico Sea Height Icon in the "Control Panel" under the chart. It has worked well for us we normally leave Apalach. about 3pm, arrive off Anclote Key or Tampa Bay next morning in daylight to spot the many crab trap floats. I second BandB too. From Apalachicola you can run inside all the way to East Pass (at the eastern end of St. George Island), and then decide whether to head ESE across the wide part of Apalachee Bay, or duck up into Carabelle. If you're really of a mind to go exploring, St. Marks is accessible and another funky little old Florida fishing village. We also love Apalachicola so choose any opportunity to go there. click on the small Gulf Of Mexico Sea Height Icon in the "Control Panel" under the chart. Place your cursor on the chart and you will be able to pause, step fwd or back 6 hr intervals, or continue running. Smart advise, thanks. 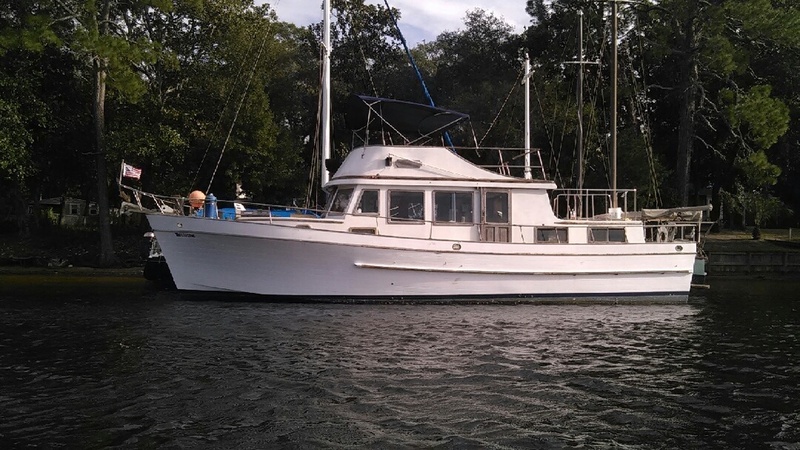 Going to run to Carrabelle via the ditch and assure all systems are tight.....it is amazing how good she handles on one engine, a good thing to know. Planning on crossing from there to Tarpon Springs. I'll be glad to have that behind me. Wonder if any transients will still be heading that way in February?